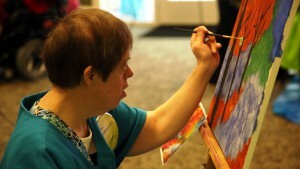 Duvall Homes’ Art for Everyone Program showcases the talents of the adults we serve. 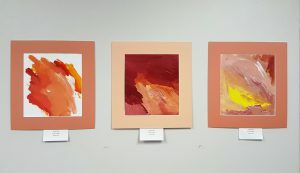 With a body of artworks created by participants at Duvall’s Opportunities Enrichment Center (Adult Day Training, ADT), viewers will see acrylic paintings, compositions in ink and other mixed media works – all representing the accomplishments of artists faced with a broad spectrum of developmental disabilities. 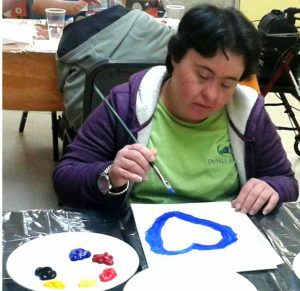 Focusing on one’s abilities rather than disabilities, the exhibit unveils an abundance of artistic talent. Recognizing the many challenges faced by the artists—including the basic task of holding a paint brush for some—only adds to the overall inspiration of each piece. 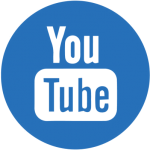 For many of the artists, creative display is a primary means of self-expression, and with limited or no verbal capacity at all, art functions as an vital communication tool. Artists have come to view their painting activity as a newly opened door, and as they have stepped through it we are witness to a new language. 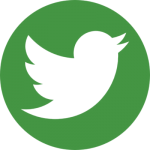 Behaviors have also been influenced – some rather dramatically. A sense of calm that suggests a type of freedom, confidence and happiness has emerged in many and we are proud to share both their art and incredible story. Each work was created through alternative ways of seeing and relating to objects and emotions. 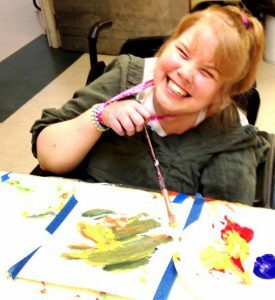 It is under these rubrics that viewers are invited to appreciate art as a reflection of individuality and to witness perception through the eyes of the developmentally disabled. The traveling exhibit has been made possible by gallery, museum and business partners, and related educational programming and resources are supported by Very Special Arts (VSA) Florida. 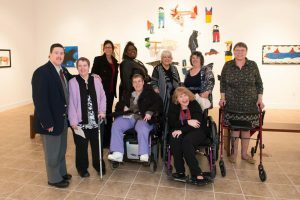 Artists and staff of Duvall Homes’ Art For Everyone Program enjoy a special exhibition at Stetson University’s Hand Art Center, hosted by DeLand Area Chamber of Commerce. The Hand Art Center at Stetson University (right), DeLand Area Chamber of Commerce & Orange City Alliance, Gateway Center for the Arts, DeLand City Hall, Ormond Beach Performing Art Center, Museum of Arts and Sciences, Athens Theatre, Ormond Beach Memorial Art Museum and Gardens, DeBary City Hall, Deltona City Hall, Orange City Hall, Cobb Cole Attorneys at Law and Florida Public Utilities. View additional photos from this evening on Duvall Home’s Facebook page by clicking here. 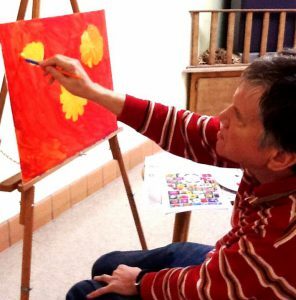 In 2015, Duvall Homes launched a new art program. 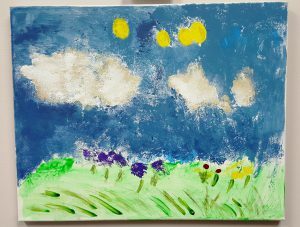 During the year, paintings created by the developmentally disabled people we serve were showcased at a variety of venues throughout Volusia County. The exhibit was so well-received by the community that we created a follow up exhibit for 2016. 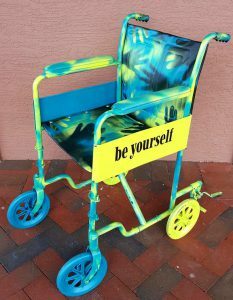 Wheelchairs used in this exhibit were creatively embellished and we like to think of them as Mobile Sculptures – just another facet of our fast-growing art program, and second in a series of traveling exhibits we call Art…For Everyone! We are grateful to the following sponsors of our Mobile Sculptures Tour who helped to create awareness: Medtronic, DaVita Labs, DeBary City Hall, Deltona City Hall, Fifth Third Bank, Florida Hospital and MBI. In the spring of 2017, participants of Duvall’s Adult Day Training Center took part in the fun and artistic community sensation of painting small stones and hiding them around the City of DeLand and County of Volusia. 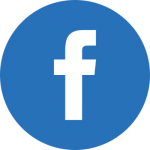 We’ve shared images of creating, hiding and discovering rocks on our Facebook Page, in our News & Events and on the streets of DeLand. View more masterpieces created by artists of Duvall Homes. See more ways How We Shine.